Join staff & volunteers for a fun day of hiking thought-out the park to see some of DeSoto’s waterfalls, big & small. See Lost Falls, Laurel Falls, Indian Falls, Lodge Falls, even more water features like Laurel Creek & the West Fork of Little River. Enjoy the scenery of DeSoto State Park while burning some calories at the same time! Moderate Terrain over 5 miles. This class is designed for those who really just want see what molten glass is all about - feel the heat, gather from the furnace, sculpt the glass into you own design. It is ultimately about the experience, some experimentation and a couple nice paperweights to take home or to the office to show your friends. Have you ever wanted to actually sit at the gaffer bench and feel what it is like to shape hot glass? In this class, it’s all about a hands-on experience in a safe and fun atmosphere with a final product we know you will love. After watching us shape glass into a flower, it's your turn to sit at the bench to a sculpt your own from an array of colors. Our artists are the to step in and lend a hand or guide you as you shape the glass. Chemistry magic, dirt paint, special effects, bubbling potions, slimes, twig art, high-bouncing balls, and messy fun experiments! Learn the basics of pine needle basketry, an old craft with a long history. Join DeSoto State Park Naturalist Brittney Hughes to learn the basic steps to making a coiled basket from longleaf pine needles. 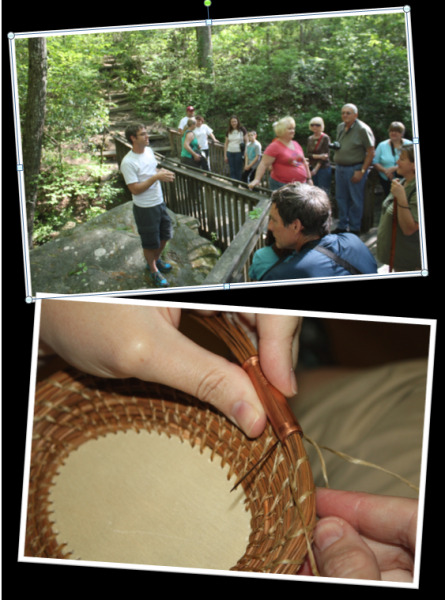 Each participant will learn the basic skills of pine needle basketry and take home their very own creation. Learn how to make and use a primitive bow drill. The bow drill is a simple tool used to ignite a small pile of dried tinder, useful in making a fire. There are five basic parts to a bow drill: the bow, the bowstring, the handle, the drill, and the fireboard. Everything you need will be supplied to make your own bow drill set. This skills class is also a bushcraft lesson on fire building, tree and plant I.D. Orbix Hot Glass is a glass blowing studio and gallery on Lookout Mountain that offers fine decorative and functional glass, as well as very popular glass blowing classes. Design and literally “blow” your own ornament with the help of a glass artist. This bushcraft class will teach you the skill of woodcarving with a lesson on knife safety and proper use. You will learn how to make your own camping utensils and a walking stick. Celebrate the season by visiting the Bunny Factory, where children are magically transformed into bunnies and learn all the basics: How to hop, decorate eggs, and more enchanting fun)! Children’s Spring Art Show, storytelling, music, baby animals, bunny games, egg hunt with prizes…a day your little bunny will NEVER forget!